Scher & Ward Opticians Welcomes all Rigid Gas Permeable Contact Lens Wearers! Fitting Rigid Gas Permeable Contact lenses (RGP) is really an art form, not just a science. Many opticians try to avoid this type of lens as they require more time in practice to fit and can take a little longer than soft lenses for the wearer to get used to. However, they also provide a number of great advantages for long-term wear and certain visual conditions. This is why at Scher & Ward Opticians our resident Contact Lens Specialist Glen Ward fits a large number of RGP wearers. 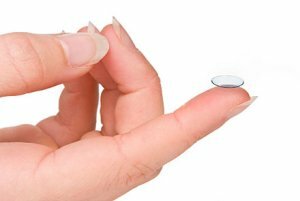 Gas Permeable contact lenses are made of a firm, durable plastic and are often prescribed to patients when clear vision cannot be achieved with a soft contact lens. Today, they are much more comfortable than the ‘hard’ contacts prescribed in the past. The newer gas permeable material allows oxygen to be delivered to the cornea and provides crisp, clear vision with a customized fit. Normally for daily wear and replaced yearly, RGP lenses are removed at night for cleaning and storing using the solutions recommended by your optometrist. Unlike soft lenses which contain water, RGP lenses resist deposits and are less likely to harbour bacteria so offer excellent eye health. Rigid Gas Permeable contact lenses are available in an extensive range of materials, fittings, powers and designs. Our resident Contact Lens Specialist here at Scher & Ward Opticians will carry out a full assessment and choose the right lens for you.